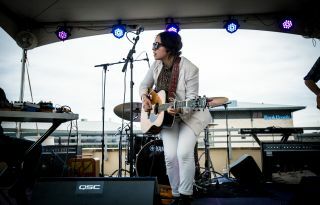 Southwest Invasion, presented by Schwinn, featured a concert series and lifestyle village held in downtown Austin, TX, during the city’s annual 10-day film, interactive media, and music festival this month. The three-day Southwest Invasion featured dozens of artists, such as Larkin Poe, In the Valley Below, A Place to Bury Strangers, Dashboard Confessional’s Chris Cabbarra and DMC, performing on two outdoor stages equipped with gear from QSC Professional, including WideLine 10 Series and KLA Series line array loudspeaker systems, KW Series and the new K.2 Series loudspeakers, PLD4.5 amplifiers, with a TouchMix-30 Pro compact digital mixer at front of house. Southwest Invasion is curated and produced by Quantum Collective, a consortium of music industry leaders including Liz Leahy, founder and CEO of Tech Company Section 101, and Dan Silver, VP of Creative at Riptide Music Group and longtime record producer of several well-known artists. The event draws over 12,000 fans annually to see 30 concerts by emerging and legacy bands as well as interact with goods and services developed by microenterprises and socially responsible brands. The PA system on the Plaza Main Stage comprised two hangs each of four QSC WideLine 10 line array modules, according to Rion King, production director and one of three partners at Austin-based Nomad Sound, which is led by COO and majority owner Damon Lange. It also featured four GP212-sw double-18-inch subwoofers across the front of the stage; everything was powered by PLD4.5 series amplifiers. Onstage, King continued, he had K12.2 two-way self-powered speakers downstage left and right doing double duty as both side fill and front audience in fill. Additional K.2 Series loudspeakers were deployed as floor monitors across the front of the stage and as audience out fill. A KW122 12-inch two-way active loudspeaker atop a KLA181 18-inch self-powered subwoofer provided drum fill. “I love the K12.2s because of the internal DSP. I was able to run pass-throughs on multiple boxes, then set up individual delays on the boxes—shooting the snare drum with my laser distance meter from the first delay—without having to dedicate delays on a console.” King, who mixed monitors for the performers on the Plaza Main Stage, continued. “To the trained ear, that nuance really makes the difference. It’s about creating a cohesive, immersive environment.” He also utilized the factory presets to optimize the wedges for vocals or instruments, according to each band’s needs. Quantum Collective and Nomad Audio brought in Philip Ramirez, owner and operator of Headwater Audio in San Marcos, TX, for the second consecutive year to run the Homegrown Stage, which is at the opposite end of the plaza from the main stage. Ramirez had a pair of KLA12 active line array loudspeakers on each side on a pole coming off a pair of KLA181 single-18-inch subwoofers, and five K12.2s for monitors, four across the front and one at the back for the drums.